Chances are that the first flash you ever owned was a speedlite. If you have been into flash photography long enough, chances are that you also shot with a studio flash at some point. Light is light and it does not really matter where it comes from, but speedlites and studio heads are obviously pretty different. The former are built for portability and ease of use, the latter for power and versatility. Well, wouldn’t it be nice if there was something in between the two? Something that would offer portability and ease of use, without sacrificing power and versatility? This is where the Bresser SJS-200 Li-battery Speedlite comes into play. This is a speedlite that promises high power and a variety of dedicated light modifiers! I am personally a fan of studio heads (especially battery-powered ones) but I had been wishing for quite some time for a speedlite that would give me more options (and more power) when out in the field, especially when shooting events (practically the only occasion when I use a speedlite rather than a head). For this reason I was very excited when Folux kindly sent me a test sample of the Bresser SJS-200, together with the compatible remote trigger WT-4I. At the time of writing the flash costs around 380€ and the trigger around 100€. All of this comes with the flash + trigger. Just the power cord for the flash is not shown. Although flash and trigger do not make a “super-premium” impression, they do feel very well built and solid. The displays are quite basic but nevertheless nicely lit and easy to read. The included accessories make also a solid impression. A carrying case is unfortunately not included and the English of the instruction manuals (yes, I had to look into them, you will see later why) is not that good (as you probably know, this is not an uncommon thing for products like this). All in all, nothing to complain about here. Do not expect a super-premium product, but you can expect a well-built one! The most interesting features of this flash are the shape and dimension of its light bulb. We all know that the larger the light source (in relation to the subject), the softer the light. A classic speedlite is a very small light source, also because speedlites project the light in a very directed and narrow way; basically the light is projected in a straight line in front of the flash. A studio flash is a much larger light source, not only because the light bulb itself is larger (it usually has a circular shape) but also because it projects light in every direction in front of the flash; and for this reason studio lamps can “fill” much larger light modifiers than those that classic speedlites can fill. The light bulb of the SJS-200 is somewhere in the middle between the two; it is built to project light in all directions in front of the flash but is still quite small. This means that light hardness and ability to fill large modifiers are also somewhere in the middle between the two. Actually under this point of view this flash is quite similar to a studio head, although a studio head has an even softer and more widely spread light. 200W may sound like a lot for a speedlite but my tests show that, when used together with the standard bowl reflector, this flash has the same output as a classic speedlite. To be precise, I made the comparison using a Yongnuo YN600EX Speedlite zoomed at 200mm and lighting an object at a distance of around 70cm (the Yongnuo has a GN of 60). When used without the reflector, the SJS-200 obviously sends its light on a much wider area and the mentioned object 70cm away gets 2,5 stops of light less. This flash cannot be zoomed like a classic speedlite so the only way of modifying the light is through the use (or not use) of light modifiers! To summarize, the quality of light you get from this flash is quite similar to a studio head, although not as soft and diffused. The power you get is instead more similar to a speedlite (or a low-power head), with the big difference that you cannot rely on your zoom settings to decide where that power should actually go to. Flash and trigger are easy to use. Sure, there are a couple of buttons which are not that self-explaining but you are ready to go even without reading the instruction manuals (I guess I am not the only one who hates reading instruction manuals?). Only activating HSS is a bit tricky; I had to go back to the manual to find out that you need to long-press the “mode” button for that. It is also nice that you can control all flash’s functions with the trigger, which displays everything you need to know, including power settings. What I disliked about the trigger is that you need to plug a USB receiver into the flash; I understand that in this way the trigger can be used with different flashes but I do not see why a receiver could not be integrated in the SJS-200. Also it seems that the power-saving/sleep function does not really work as supposed, in fact leaving the trigger turned on drains the batteries very quickly; not such a big deal anyways, you just need to remember to turn it off after use. Additional light modifiers can be purchased and attached to the flash through a dedicated mount, similarly to how studio heads work. I only used the standard reflector, which is delivered together with the flash, and it attached very firmly and easily. The flash works fast, consistently and reliably. The transmission with the trigger works well and I did not experience any misfires (with one exception, as explained later). Although some small improvements could me made, flash and trigger are reliable and easy to use. 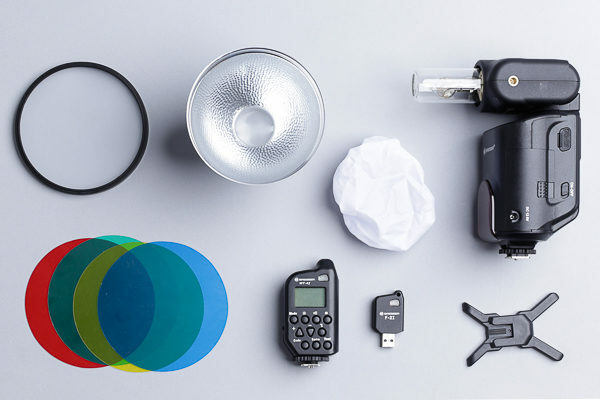 The possibility to attach dedicated light modifiers to the flash makes it more versatile. As mentioned at the beginning, my biggest wish for this flash was that it would help me whit event photography. Although I love using strobes every time I can, at events I usually use an on-camera speedlite. What I dislike about this setup is the hard, direct and artificial-looking light you get. Sure there are ways to modify your light even in such a situation (bouncing light off surfaces, tweaking zoom settings, using diffusers…) but I thought that a larger light source would help… Unfortunately this was not the case. The main problem here is that the light can be directed only using light modifiers. So let’s say I am shooting a wedding, I will typically need to direct my light in different ways all the time. For example if I am shooting a group of guests in the church I will need to send the light over a much larger area than what I will do when I am shooting the ring exchange. With a classic speedlite I can control what I am lighting through my zoom setting (and indeed this is usually done automatically by the flash depending on the focal length I am using); with the SJS-200 the only way of doing that would be carrying around many different light modifiers and switching them as needed, which is obviously impossible (without mentioning that there are not actually that many modifiers available). Also, with a classic speedlite, light can be bounced off surfaces or the head can be tilted in order to make the light less direct; with the SJS-200 you basically have two options, using a reflector (or whatever other modifier), which makes light more directional and hence trickier to be bounced, or using no reflector, which sends light everywhere and makes it harder to light distant subjects. To give you an example, the “classic” indoors speedlite setup, where the head is tilted slightly up and the small white reflector is used to direct some light into the subjects’ eyes, is impossible with the SJS-200. You either use it with a reflector and pointed directly to your subjects or without the reflector and lighting anything close to you (including let’s say the white shirt of a guest close to you at the edge of your frame, when what you are interested into are the spouses standing a few meters away in the middle of the frame). Also the Lithium battery may sound like a very good thing for event photography but it is actually not. 350 shots are not that many and buying extra batteries can get very pricey (an extra battery costs around 100 euro at the time of writing). Also, classic speedlites can be used together with external battery packs, the SJS-200 cannot. Battery packs not only increase the time you can shoot without swapping batteries, they also make your recycle time faster. And indeed 3.5 seconds recycle time (at full power) can be an awful lot at events, especially when you need to shoot at full power a lot because you waste much of your output lighting unnecessary areas. I am not a fan of TTL but at events this can be useful and this flash does not offer it, which is quite hard to accept from such an expensive flash considering that most speedlites (and an increasing number of strobes) do offer TTL. HSS is also very useful at events and this flash does not offer it when mounted on-camera, which is also unfortunate. Last but not least, the flash is bulky and heavy. Not only will your arms (and shoulders) get tired faster than with a lighter speedlite, you will also get a lot of unwanted attention in a situation where you actually want to be as discreet as possible! 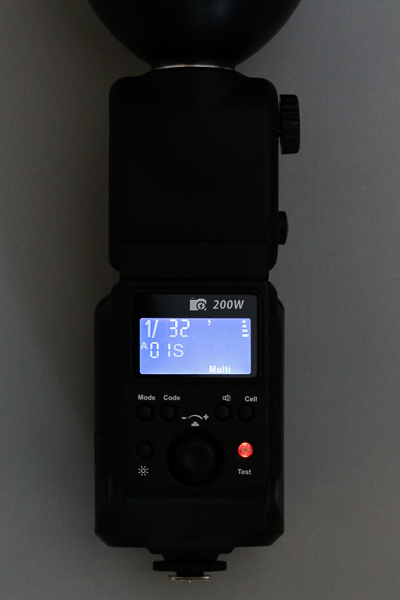 To put it simply, I do not see any real advantages over a classic speedlite when using the SJS-200 on-camera. Sure, you can light your subjects with a softer light (assuming that the light does go where you want it to go) and you can project your light over a larger area but you need to give up all the flexibility that a classic speedlite grants. Besides, you will probably scare and annoy your subjects and end up with sore arms. Indeed, although I did try to use this flash at events, I always switched back to my classic speedlite very fast (and very happily). Although at the beginning I was not really interested in using this flash off-camera (as I am a happy studio flash user and I do not mind taking my battery-powered heads around), I did find out that this is where it shines. Normal speedlites are tricky to be used off-camera together with light modifiers, not only because they do not offer any mount to firmly attach them, but also (and I would say, most importantly) because they are not made to effectively fill a modifier with light. Normal speedlites project the light in front in a straight line and, although some modifiers made for speedlites succesfully take this into account (they are built to spread that narrow light inside the modifier), large modifiers and speedlites do not really go well together. The SJS-200 solves both problems. It offers a mount to accommodate light modifiers (although only dedicated ones) and, thanks to its round flash head, it projects light in front in all directions, filling larger light modifiers. How large I cannot really say as the only modifier I had the chance to test was the standard reflector (which by the way is around 12 cm wide) but I guess here it should work (almost) as well as a 200W strobe. How I actually liked to use the SJS-200 is bare-bulb, in order to get a light which covers a large area but is quite hard. Sure you can get a similar light from a studio head (from a normal speedlite not really) but it is tricky, as the studio head’s construction simply results in a softer light, as already explained, and any attempt to make it harder results in a smaller lit area (when the distance to the subject does not change). What I also liked about this flash, although it may seem like a small detail, is that you can actually point the head a bit downwards (as you can understand from the picture at the beginning of this article), as this is actually the position you will use the most when off-camera. If you want to tilt it more (and you will most likely want to) you obviously need a (umbrella) bracket. The fact that you can use it also while plugged into the power outlet makes it very convenient for indoors use. 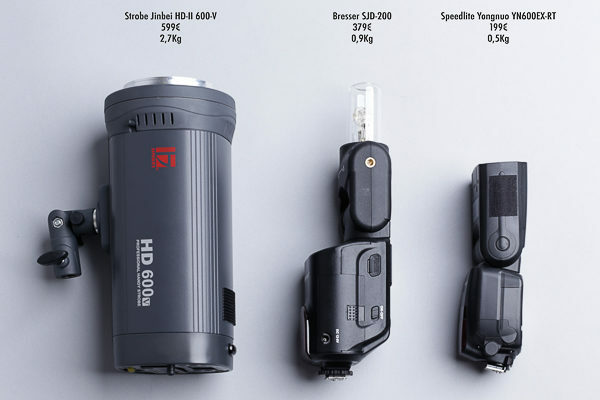 But obviously this flash is made for portability, so if you shoot outdoors with it you will probably need an extra battery, as 350 shots (at full power) are not many; this extra battery will mean additional costs. I also experienced quite severe transmission problems when controlling the flash with the WT-4I trigger through metallic shutters. Around 20% of the times the flash would simply not fire. Replacing the transmitter with the Yongnuo YN622-TX (combined with the YN622 receiver) solved the problem. In all other situations the WT-4I worked very good and, as mentioned, it is very nice to be able to control all flash’s functions remotely and to be able to see all settings on the trigger’s display. To summarize, when used off-camera this flash has some real advantages over a classic speedlite, although it should be clear that it cannot offer the versatility (and, depending on the model, the power) of a strobe. It should also be clear that using this flash outdoors is tricky, due to the very limited HSS function. And, considering that is actually made for portability, this is indeed a very big minus! The Bresser SJS-200 is a kind of a hybrid product, which tries to combine the advantages of speedlites and studio heads into one single portable (but not that lightweight) flash. As a hybrid, it is hard not to compare it to the products it is meant to “replace” and we saw that indeed it does have some of the speedlite’s characteristics (portability) and some of the studio light’s characteristics (light quality). Still it cannot be seen as a replacement for either of them. It is not suitable for on-camera use, where the classic speedlite obviously excels, and it is very limited in comparison to a strobe when used off-camera. If you are looking for a studio light, but you wish it would be easier to carry it around, then the SJS-200 may indeed be what you are looking for; for example I can easily imagine it packed in the luggage on a long trip. Still you need to think if in such a case a classic speedlite may not be enough; for example there is a lot you can do with a classic speedlite and just one single reflective umbrella. If you still think that the SJS-200 is what you want, you need to know that you are giving up quite a lot in comparison to a classic speedlite and still do not have something equivalent to a studio head… Although you may end up spending almost the same price as a battery-powered HSS-capable head (taking into consideration the extra battery that you will most likely need). If portability is very important for you but you still want a studio-like light quality, then you will be happy with the SJS-200. In this case you may as well get the WT-4I trigger, as being able to control all flash’s settings remotely is a real treat! The Bresser SJS-200 and WT-4I are available through the Folux website (which is in German and Dutch). Francesco Rizzato is a people and fashion photographer based in Munich, Germany. You can find more information and contact him through his website.